Our Standard Contractor's Style Nomex Coveralls are constructed with a two-way brass zipper front closure, by-swing back, and a variety of concealed snap closure pockets. 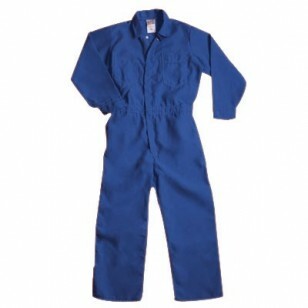 The Nomex coveralls have elastic waistband for comfort and a five-thread safety stitch. The 6.0 oz. Nomex IIIA Aramid material is inherently flame resistant for the life of the garment. The flame resistant properties will not wash or wear out. DuPont Nomex material is an inherently flame-resistant material and the materials flame resistance is not affected by washing or laundering. When the Nomex Coveralls are exposed to flames the material fibers swell and become thicker, forming a protective barrier between the heat source and the skin. The Nomex Coveralls will not melt, drip, or support combustion and they resist breaking open giving the wearer extra time to escape the hazardous situation. In essential performance areas such as flame resistance, thermal protection, comfort and durability, nothing compares to Nomex. Its thermal technology resists the hazards associated with electric arcs and flash fires - including intense heat and flame. And, Nomex brand fiber provides valuable peace-of-mind, which enables those who wear it to focus on the job at-hand and perform to their fullest potential. Nomex coveralls, for peace of mind!